Welcome to Desert Steel Buildings! 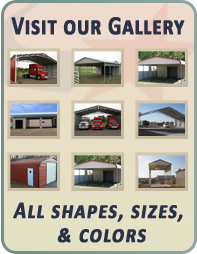 Our mission is to provide Arizona and California with quality steel buildings at affordable prices. Whether you are looking for a basic carport to keep the frost off of your windshield, or a fully enclosed industrial garage, we have the building you need. .
Don’t see what you are looking for? We will gladly build a custom steel building to your specifications. Our steel buildings are constructed of the highest quality materials, and built to withstand the elements. With our commitment to quality and customer service, we are confident that you will be satisfied with your Desert Steel Building for years to come. Our certified buildings are warranted against snow, and up to 90 MPH winds. We understand that our customers are all different, and so are the climates that they live in. You get to choose what snow load and wind requirements you will need. When you choose Desert Steel Buildings, you will also enjoy free delivery and installation by our professional installers. Contact us for a quote today. You will be glad that you did.